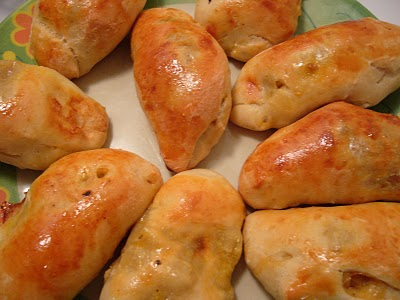 Piroshki is individual sized buns baked or fried stuffed with different variety of fillings. A common variety of piroshki are baked stuffed buns made from yeast dough and often glazed with egg to produce the common golden color. Beat the yeast and sugar together in a medium bowl, and then stir in the milk. Combine the flour and salt in a large bowl and make a well in the center. Pour the yeast mixture and the melted butter into the center of the flour. Stir from the center until the batter is smooth. Place in a lightly oiled bowl, covered with plastic wrap and leave in a warm place for 40-60 minutes, or until the mixture has doubled in size. Slice the eggplant thinly, score the surface with a fork, and then sprinkle liberally with salt. Line the inside of a colander with a slices and set a side for 30 minutes to allow excess liquids to drain. Rinse the eggplants well under running water, to remove the salt; pat dry with paper towel, and then chop finely. Heat a butter in a pan and cook the onion and garlic over medium heat until soft. Add the eggplant and the tomato paste; season with salt and pepper to taste. Continue cooking until the eggplant has softened and is cooked through. Remove from the heat and set aside to cool. Preheat the oven to moderate 180c. Brush a baking tray with oil or melted butter. Knead the dough lightly and then divide the dough into 40 portions. Working with one at a time, flatten each portion into a small disc and place a teaspoon full of the eggplant mixture in a center. Wrap the discs to enclose the filling and press the edges firmly together to seal. Place assembled pastries, sealed side down, on the tray. Set aside in warm place for 20 minutes. Brush the piroshki with beaten egg and lightly sprinkle the sesame seeds over the top. Bake for about 10-12 minutes or until they are golden brown. Tip: You can also change the filling according to your taste. I love them with chicken filling and you can also use some leftover vegetables or anything you like.